BDS Founder Omar Barghouti honored at EU event hosted by MEP Ana Gomes, calling Israel an 'apartheid' state and justifying his actions. European Parliament Member Ana Gomes on Tuesday hosted an event titled "The Israeli settlements in Palestine and the European Union" and focused on slamming Israel and legitimizing BDS. 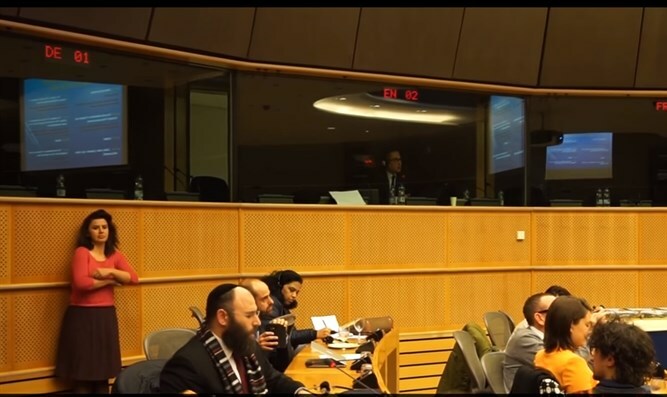 The event was held at the European Parliament, and speakers included BDS movement founder Omar Barghouti, Palestinian Authority representative to the EU, Belgium, and Luxembourg Abdalrahim Alfarra, and Institute of International and Development studies in Geneva researcher Tom Moerenhout. The event took place despite numerous representations against it because of the presence of Barghouti, whose anti-two state solution comments, boycott calls and veiled anti-Semitism comments run counter to stated EU policy. Gomes began her remarks by saying she was happy that the meeting was taking place despite the efforts of the 'perverse' Israel lobby. She then went on to chastise the EU for complicity in not doing enough to tackle settlement construction, a phenomenon she referred to as a cancer affecting the peace process. Alfarra listed a litany of views related to the occupation and urged more EU states to recognize "Palestine." Barghouti then outlined his perceived justifications for BDS' actions, repeatedly calling Israel "apartheid" and accusing the government of far-right tendencies. Finally, the researcher outlined the legal case for boycotts and claimed the EU was in breach of legal obligations when trading with Israel. The event was then opened to questions, mainly from Jewish and Israel advocates who called for a retraction from Gomes due to her un-parliamentary language, and calling out BDS as anti-peace process. European Jewish Association Chairman Rabbi Menachem Marglin noted that BDS ultimately harms Palestinian Authority Arabs, since it harms the factories providing them with jobs. He also asked Barghouti to state whether his true intention was to help "Palestinians" or whether BDS' policy is simply a result of "hating Jews no matter where they live." Both the event's organizers and Barghouti had charges of anti-Semitism leveled against them. In their responses, Gomes refused to retract, said she was not anti-Semitic. Barghouti called those accusing BDS of being anti-Semitic of being anti-Semitic themselves, said accusations of harm against Palestinian Authority were "patronizing," claiming his actions were entirely justified. The event was not well attended by MEPs, and perhaps 5 in total attended, all of whom are anti-Israel from the left political fringes, including Italian communist radicals.